Hello! ♥ I'm Kristin, a rambling, obsessive, artistic, super-geeky, animal-loving twenty-seven-year-old. My main obsessions in life are anime and manga, animals of all shapes and sizes (but especially birds--from poultry to wild birds to tropical birds and domestics), collecting Pokémon plush and figures, writing, drawing, and cosplaying. Anime soundtrack composer Yoko Kanno is another one of my major obsessions. I'm an INFP (the Healer), a Pisces, and a Dragon in Chinese astrology. 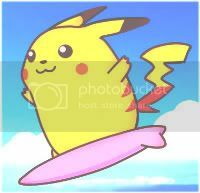 My username is derived from my love of surfing Pikachu! Pacific Pikachu used to be the name of a cheat one could use to get surfing Pikachu using a Gameshark, all the way back in the Yellow era. I tend to use this username on most sites I frequent. I do a lot of rambling about RL stuff and especially about my 100+ pets (my poultry hobby in particular is a constant source of fun/happiness/excitement/heartbreak), so just be forewarned! When I get the time and/or feel like it, though, I do post about Pokémon (my favorite fandom) as well as other fandoms I love. On occasion I'll post art, though going to my DeviantArt account is a better way to keep track of that. I do post animal photos fairly often, so if you love animals I'm the right person to friend! Please note that I am a big proponent of animal rights. I am not a fan of humanity as a species (though I love a great many individuals) and I get very emotional about the treatment of animals at times. I am a supporter of the Voluntary Human Extinction Movement and deeply concerned about overpopulation. I have a deep-seated fear of pregnant women and babies and may speak of them in less-than-flattering ways at times. I am agnostic and very liberal. I will usually provide warnings, however,before discussing controversial topics. In general I am very easy to get along with, I am mellow and do not anger easily. Favorite anime include: Pokémon, Cowboy Bebop, Wolf's Rain, Tengen Toppa Gurren Lagann, Dennou Coil, Mushishi, Gankutsuou, Satoshi Kon works, Studio Ghibli works, Honey & Clover, Haibane Renmei, RahXephon, Neon Genesis Evangelion, Last Exile, the Haruhi series/movie, Kino's Journey, Natsume Yuujinchou, Gunbuster/Diebuster, and many others! Favorite books include: The Last Unicorn, Watership Down, Ender's Game, The Power of One, Beloved, Tailchaser's Song, The Plague Dogs, Eternal Treblinka, Thanking the Monkey, and Old Souls. Seriously or semi-seriously: Umbreon, surfing Pikachu, Mew (mostly plush and some figures/miscellaneous items), Eevee (mostly plush and some figures/miscellaneous items), Chikorita, Buizel, Togetic/Togekiss, Lapras (plush and some figures/miscellaneous items), Minccino (plush and some figures), Unfezant (everything), and Larvitar (plush and some figures/miscellaneous items). I also collect items of Ash/Satoshi and Misty/Kasumi, especially together. Casually: Azumarill and family, Dragonite and family, Seel/Dewgong, Bayleef/Meganium, all quadraped canine Pokémon, 'Chus, Politoed, Pidove and Tranquill, Oshawott.